Mr Killa performs Run with it at the International Soca Monarch Semi-finals at the Arima Velodrome on Sunday night. Photo by Jeff Mayers. Grenadian soca star Mr Killa, real name Hollice Jonah Mapp, picked up the International Soca Monarch (ISM) semi-finals and ran with it on Sunday night, taking the pole position as he and seven other soca artistes enter the finals on Fantastic Friday. His performance of "Run with it" left the Arima Velodrome in shambles after the crowd literally picked up various items – garbage bins, coolers, bags, and even people – and began running from end to end of the Velodrome. Even MC Sunny Bling was seen backstage picking up someone's laptop to run with it. Dressed in a cowboy costume, Mr Killa took a moment in his performance to lay claim to the ISM. "Go to the judges and tell them Soca Monarch is mine!" And go they did, toting various items along with them. Not to be outdone, "Water Lord" Neil "Iwer" George brought blessings for the ISM crowd and left the Velodrome drenched. The soca icon, dressed in a red and gold choir gown and accompanied by back-up dancers dressed in blue, was calm and confident as he performed his song "Blessings." The crowd, however, was flooded with excitement as fans jumped, waved and splashed water everywhere. Iwer and his back up dancers supplied the crowd with even more water. Plastic bottles could be seen flying through the air as Soca lovers drenched the Velodrome. In the groovy category crowd favourite Blaxx owned the stage with his song, "Gyal Owner," but advised the crowd, particularly the men, that "you can't own a woman." "Since I sing this song men vex with me," Blaxx said. "But lemme tell you something. You can own a house, you can own a car but you cannot own a woman!" 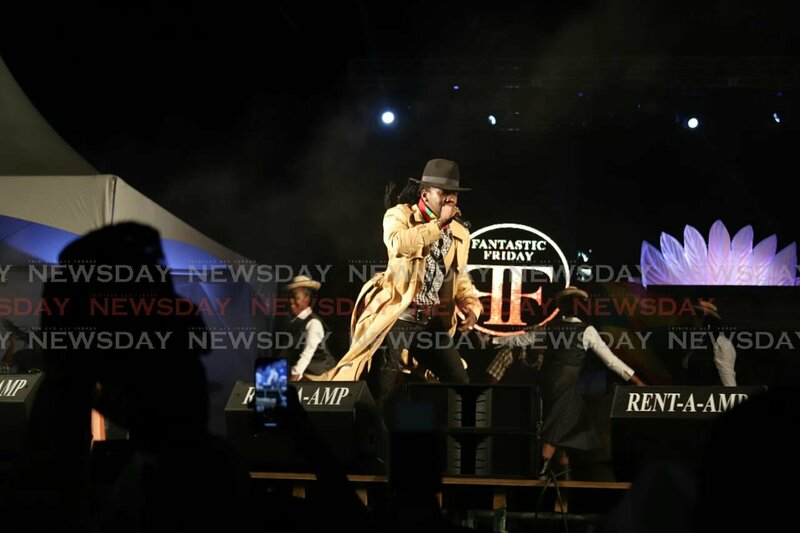 The women in the crowd seemed to enjoy his performance but it did not impress the judges, who placed him third in the standings after Teddyson John with his song "Vent," and Swappi with "Party Start." The night was not without its duds, though. One performer, Jo Jo, could not get the crowd moving with her song, "Start It," despite her best efforts. The young artiste came in dressed in a carnival costume, and was accompanied by a slew of back-up dancers and ended her performance by flinging a fistful of dollar bills at the crowd. She will perform in the finals. The artistes were accompanied by the Viking Band with intervals by the All Stars. The crowd was well fed with a canteen at the entrance and drinks were sold at affordable rates. Sunny Bling kept the crowd entertained as well and ensured the flow of performances was steady. The night was well put together and patrons left with smiles on their faces. Reply to "Mr Killa picks up soca semis and runs with it"